How old are homes in Los Gatos? Los Gatos is well known for having beautifully maintained historic properties and neighborhoods. Not every older house is historic, and not every structure that looks like a Victorian hails from that era. So – how old are homes in Los Gatos? One of my tools a a member of the National Association of Realtors is the Realtor Property Resource, or RPR, report generator. This last week I’ve been seeing what it can do. 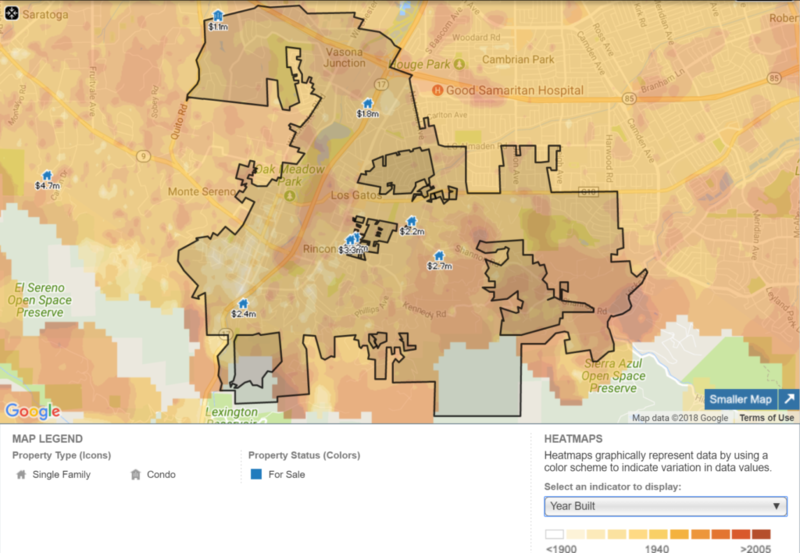 One interesting angle is the “heat map” function, which can be used in a few ways , including to shed some light on the age of houses or properties in town. Unfortunately, I could not see if there was a way to eliminate the homes for sale, so they are scattered throughout the image. You can also see the unincorporated pockets within town as islands within the town’s boundaries. Viewing this heat map, which displays the ages of homes and neighborhoods in Los Gatos, we can get a sense of where and when the town expanded. For most of Santa Clara County, or Silicon Valley, a 20 year old home is “young”. On the map above, you can see that the Heritage Grove subdivision in east Los Gatos (just off Blossom Hill Road) shows up as a warm red. It was built in 2000 – almost brand new by local standards!